Is Deep Carpet Cleaning Safe During Your Pregnancy? Is Carpet Cleaning Safe During Pregnancy? There are many rules and restrictions for women during pregnancies. A woman’s diet is monitored and scrutinized as well as their behavior during later months of the pregnancy. Women are often recommended not to fly in an airplane during later stages of their pregnancy or subject themselves to extraneous physical activity. Women need to be careful around chemicals and fumes too. There are many chemicals associated with cleaning and carpet cleaning. Should a woman schedule carpet cleaning during pregnancy? First, we do not recommend a pregnant women using rental carpet cleaning machines. The machines are very heavy to lift and push around and the machines require detergents and various chemicals in order to clean carpet. If you feel you need your carpet cleaned during your pregnancy we definitely recommended hiring a professional carpet cleaner. Before you decide which carpet cleaning Fort Wayne service to hire you should do a little research to see what kind of chemicals or solutions are used for their service. Ask as many questions as you need to until you are comfortable. Some steam cleaners don’t use chemicals to clean the carpet but they do use chemicals or an acid-rinse to rinse out the soap from the carpet. You want to subject yourself to as few chemicals and toxins as possible during your pregnancy. If you want to be 100% sure that carpet cleaning is safe for your pregnancy call a green cleaning Fort Wayne service. Chem-Dry of Fort Wayne carpet cleaning uses eco-friendly solutions and green products for superior results. We don’t use any chemicals or rinses either. We just use a mixture of water and carbonation and a gentle cleaning process that delivers powerful and longer-lasting results. 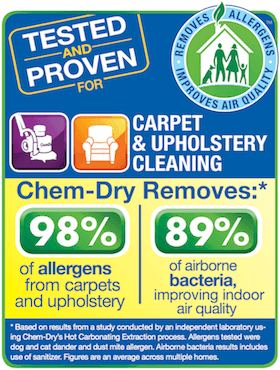 If you hire Chem-Dry of Fort Wayne your carpet and home will be healthy in time for the baby’s arrival. Call (260) 409-1138 today to schedule an appointment.